It was to be the first film of Film and Television Institute of India (FTII) direction alumnus from the batch of 1971, Vinay Shukla, and was initially called Wohi Baat. Shukla, known for writing more than 20 films including Ram Jaane (1995) and Virasat (1997), besides directing features such as Godmother (1999), Koi Mere Dil Se Poochhe (2002) and Mirch (2010), was at the time assisting director Raj Tilak on Mukti (1977), which starred Shashi Kapoor, Sanjeev Kumar and Vidya Sinha. The film’s cinematography was in the hands of Shukla’s FTII senior, KK Mahajan, while Pran Mehra was in charge of the film’s editing. One day, in Mehra’s editing room in Prabhadevi, where he was editing the song Pyar Hai Ek Nishan Kadmon Ka, Shukla, with the typical bravado of a film school pass out, dared to suggest that Mehra delay his end cutting point in a the title shot of the film by 8 frames. Mehra looked at him and then at Raj Tilak, wondering who the hell he was and then to get back at him, actually went frame by fame, 8 frames down. Fortunately for Shukla, he too thought this was the better cut point and adjusted the shot, shifting his starting point down by 8 frames. Mighty impressed by him, Mehra then confided to Shukla that he was not likely to realize his dream of becoming a director but he would love to produce a film if the latter had a suitable story in mind for a film. Parikshat Sahni and Shabana Azmi in Sameera. Shukla got Kamleshwar to write Sameera‘s story, which got approval from Mehra immediately. 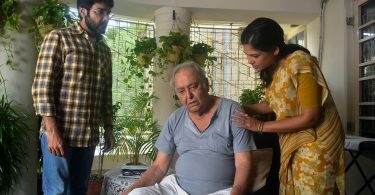 KK Mahajan readily came on board, both as a co-producer and cinematographer, while finance broker Hasmukh Shah agreed to raise funds for the film. Regarding the cast, Shukla, who had co-written the screenplay and dialogues of Parinay (1974), found his heroine in the film’s leading lady, Shabana Azmi. 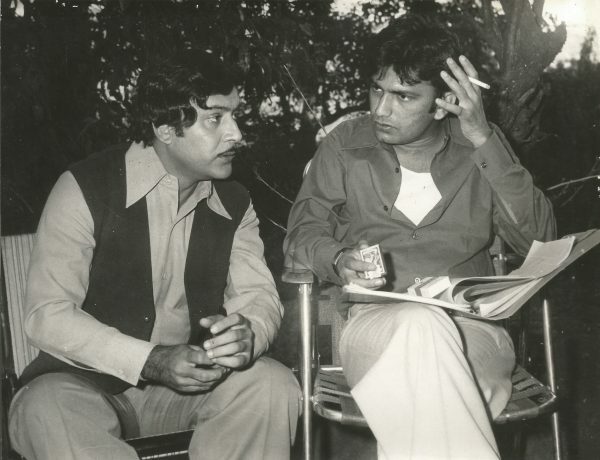 Having liked his performance in Tapasya (1976), Shukla opted for Parikshat Sahni as one of the male leads and for the other, he chose Mithun Chakraborty, fresh from just having acted in Mrinal Sen’s Mrigaya (1976) for which he would win the National Award for Best Actor. Sameera saw Mithun playing his first lead role in Bombay filmdom. And finally, Amol Palekar was brought in as the commentator or ‘sutradhar’ of the story. 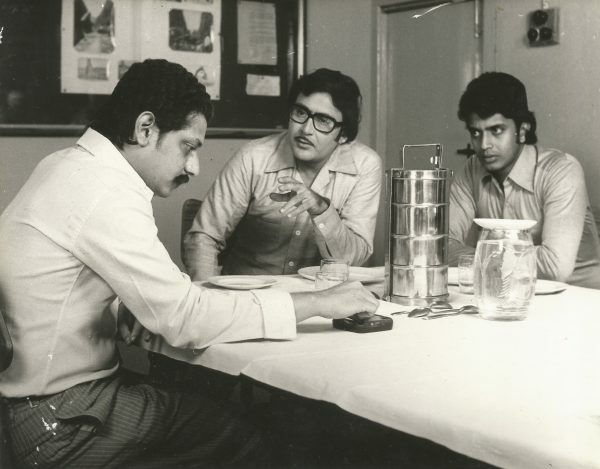 Amol Palekar, Parikshat Sahni and Mithun Chakraborty in Sameera. The film was shot in 1977 in 29 days over two schedules. Shukla recalled he treated the subject rather subtly and differently, inspired by the European cinema he had seen at the FTII, with considerable help from KK Mahajan’s evocative lensing. Sameera (Shabana Azmi) is married to ambitious civil engineer, Prashant (Parikshat Sahni), who is transferred to a remote location where a dam is being constructed. While they are in love, Prashant gives his work priority and keeps making frequent trips to Bombay, now Mumbai, to pursue his promotion, neglecting Sameera in the process. On one of these trips, Sameera falls ill. She is looked after by Prashant’s deputy, Nakul (Mithun Chakraborty), and in the process they get involved with each other. Sameera and Prashant part ways and the now promoted Prashant leaves – literally handing over his job and home to Nakul. Nakul and Sameera get married. But her guilt over what happened earlier when Prashant was away, coupled with Nakul’s increased workload see a repeat in Sameera’s life. This marriage too hits rocky waters when Prashant returns and helps the couple to resolve their issues and save their marriage. Mithun Chakraborty and Shabana Azmi in Sameera. The film’s music was scored by Jaidev, who composed 4 beautiful songs for the film. Initially, Sahir Ludhianvi was to write the lyrics for the songs but sadly, he fell ill and much to Shukla’s disappointment, backed out of the film. Naqsh Lyallpuri then stepped into Ludhianvi’s formidable shoes and did a wonderful job particularly with the two versions of Zehar Deta Hai Mujhe Koi Dawa Deta Hai, sung by Bhupinder Singh and Asha Bhosle respectively. 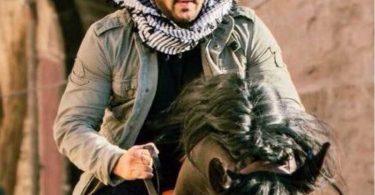 After the filming was over, the original title was thought to be too heavy and the film was named after its central character, Sameera. Following the film’s edit, Hasmukh Shah thought it best to try and sell the film first, get more funds in and then complete the film. However, both Shukla and Mahajan felt that as the film did not adhere to typical Hindi film tropes, it was better to complete the post production completely and then try to market the finished film. Shah won out but as Mahajan and Mehra were both not the typical pushy producers, work on the film came to a halt. In the midst of all this, tragically, Mehra passed away on November 6, 1978. Sameera was finally completed and censored in 1981 and was shown as part of the Indian Panorama at the International Film Festival of India in 1983 where it was appreciated by all who saw it. Sadly though, the film was thereafter unable to manage a theatrical release and remains unreleased to this day. Even the National Film Archive of India (NFAI) at the time somehow did not request the makers for a copy of the film’s print, considering its showing at the Indian Panorama. This is all the more heartbreaking as the sole remaining print has now deteriorated over time and is no longer in any sort of shape for projection. Parikshat Sahni and Vinay Shukla on the sets of Sameera. Congrats. Very interesting n infirmative. Damn useful for cinema students n historian. Very nice description of a beautifully made film and the film goers were deprived of such a gem. The film should be salvaged even at this last stage. People have worked for it. Incidentally, when and how did K.K. Mahajan die? He was a friend.